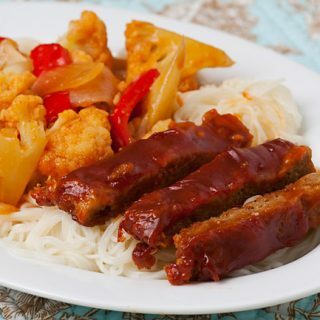 This sweet and sour seitan starts with baking your own seitan in the oven; then it’s finished in a delicious, orange-based sauce. This all has absolutely nothing to do with today’s recipe; I’m just bubbling over with so much excitement that I can’t help sharing. 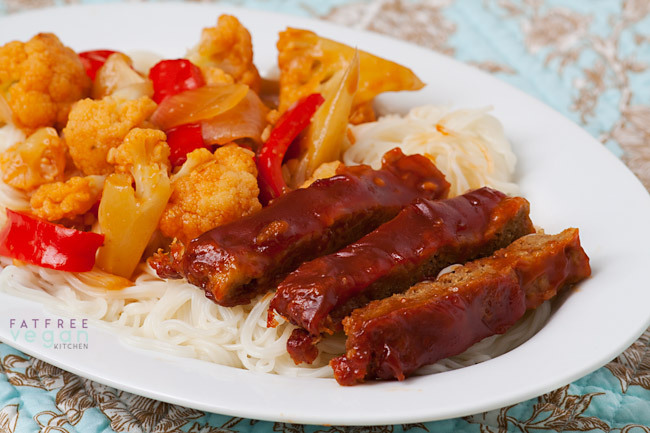 No, today’s recipe stems from another kind of excitement–my newfound passion for baked seitan. I’ve been a little obsessed with baking gluten (which is what it technically should be called, since seitan is by definition simmered in broth) ever since the Veggeroni. My success with that recipe led me to try making Ribz on the grill, and my whole family loved them so much that I knew I’d have to start working on variations of the recipe. So a couple of nights ago, with no grill at hand, I decided to rework the Ribz recipe with a sweet and sour pineapple-based sauce. I had the gluten in the oven and was ready to make the sauce when I discovered that I was all out of pineapple chunks. So I racked my brain for about 5 seconds and came up with orange juice as a substitute. The sweet and sour seitan came out delicious, though I have to say that I like it better on the grill. (You have to be careful not to over-cook it because it can dry out along the edges.) Otherwise it and the sauce were a big hit. And once again, I should have doubled the recipe, but didn’t. The three of us devoured it in record time! This isn’t as complicated as it appears at first glance. Get your gluten in the oven and then make your sauce and, if you want, your vegetables. By the time the seitan is done, the vegetables should be ready too. Preheat the oven to 350 and lightly spray an 8×8 baking dish with canola oil or line it with parchment paper. Mix the first 3 ingredients together in a large bowl. Mix the water with the peanut butter, sesame oil, soy sauce, garlic, and ginger and add it to the dry ingredients. Stir to mix well and then knead lightly for a couple of minutes. Put the dough into the baking dish and flatten it so that it evenly fills the pan. Take a sharp knife and cut it into 8 strips; then turn the pan and cut those strips in half to form 16 pieces. Put it in the oven and bake for 20 minutes. While it’s baking, prepare the sauce, below. After 20 minutes, pour half of the sauce over the top of the seitan, spreading it to cover completely, and return the seitan to the oven. Cook for 10-15 minutes. Remove from oven and cut apart to serve. Put a couple of tablespoons of water into a non-stick saucepan and heat over medium-high heat. Add the garlic and ginger and cook for about 2 minutes. Add all remaining ingredients except the cornstarch and broth and heat until boiling. Mix the cornstarch with the vegetable broth until smooth and stir it into the sauce. Cook, stirring, until mixture thickens. Keep warm on lowest heat until needed. Use half of the sauce to bake the seitan and the remaining sauce for dipping. Or you can do as I did and use it to season some “steam-fried” veggies (see Notes, below). You can use the remaining sauce for dipping, or you can do as I did and use it to season some “steam-fried” veggies. Heat a large, covered wok or deep skillet over medium-high heat. Add the onion, and sauté until translucent and beginning to brown. Add the garlic and ginger paste and sauté for one more minute. Add the cauliflower and about 1/4 cup of water. Cover immediately and steam for 4 minutes. Add the bell pepper and a little more water if necessary; cover and cook for about 2 more minutes, until cauliflower is tender but still crisp. Add the sauce to the vegetables and use a little vegetable broth to deglaze the pan and get all of the sauce out. Stir and cook until warm throughout, about 5 minutes. 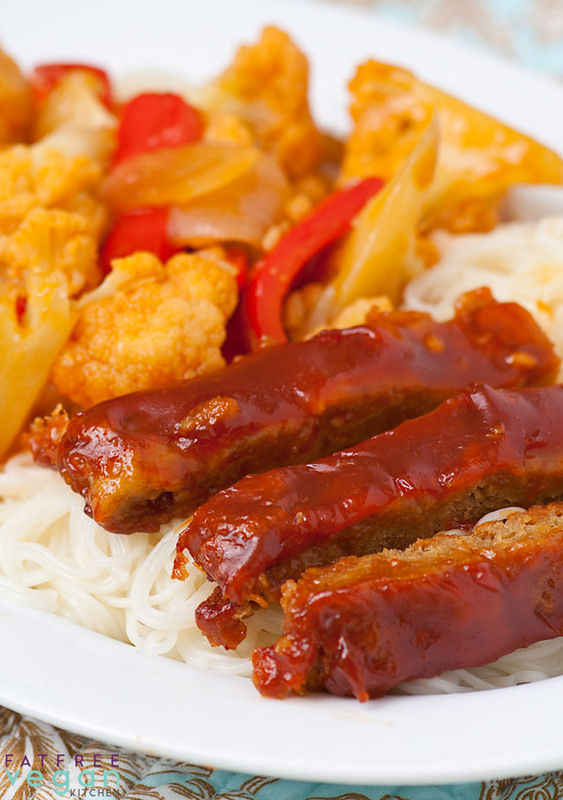 Serve over noodles or grain with seitan strips. I followed the directions lotusland posted for cooking and everything was great, really yummy sauce too. quick tip for people doing this for the first time. when you try to put the seitan into the baking dish it will not look perfect cause it is very elastic like and it is much easier to cut it after it has cooked, much easier. Susan, do you have more recipes like this that are more like a total meal? Thanks! This looks so delicious!!! I'll be making it soon! Thank you for this recipe! It actually took me 35 min to cook the seitan in the oven as I put it in a thick pottery square pot so that I could add the sauce afterwards. My guess was that you cook it till it is spongy like real seitan so it depends on what everyone is cooking it in. I love this sweet and sour sauce. I served it over tofu, but I really want to try my hand at seitan. Do you know if it freezes well? I’d love to have home-made seitan available to me no matter how short on time I am. Suzie, I don’t see any reason why seitan wouldn’t freeze well. Most of the commercial, frozen meat substitutes contain wheat gluten, so I say go for it and make your own! As an inexperienced cook, and someone who’s relied heavily on dairy for their cooking for a long time, I made two mistakes: 1. I used active yeast instead of nutritional yeast (I KNOW, so dumb). So my seitan came out delicious, but suspiciously bready along any cuts. 2. I didn’t stir the corn starch together with the broth before adding it, I just tossed in two spoonfuls along with the rest of the sauce ingredients. As a result, the sauce had some strange gelatinous blobs in it, but no one was bothered. Now that I know better, I can’t wait to make this dish for my extended family next week. Wish me luck! Jenny, this one was tough, but I did it! Just remember that the nutrition is approximate and will vary depending on the exact ingredients you use. I’ve been a big fan of your blog for over four years now. I’m always inspired and wanting to get in the kitchen every time you post – I guess that means tomorrow I’m making black bean soup with pineapple in it! I made this seitan recipe minus the orange sauce. This was so good! Thank you so much! I baked it 20min, then put on the orange sauce (sans tomato paste, not a fan, never have that in the pantry)….and baked 25min more. Served it over a steam-fried mix of asparagus, zucchini, celery, baby carrots, onions, mushrooms, red peppers, and snow peas. Then served all of that over a big bunch of fresh spinach (yes, it was CSA box week!). Next time I think I’ll serve it over bok choy, but it was OH SO GOOD. THANKS so much for sharing your expertise and inspiration with us. I’ve cooked for years but never had so much fun with food. So glad you liked it! The fat in the peanut butter helps the texture of the seitan by coating or shortening the strands of gluten (or something like that–I forget the exact science behind it!) You can leave it out, and the texture may or may not suffer much. I arrived at 2 tablespoons as a compromise because most recipes call for a lot more oil or margarine, but I’ve never tested it with no fat at all. Please let me know what happens if you try! Thanks for your recipe, I’ve just put a double recipe of an inaugural batch in my oven. It smells lovely! I pinned your photo too to get the word out. Cheers! I made this yesterday and it was amazing. I think it could have gone in the oven for slightly less time, and I managed to forget to put rice on at the start so ended up having to have white rice as it cooks more quickly, but still we loved it. I am really glad to have found your blog, almost every recipe I have seen on here looks delicious! This recipe is delicious! My seitan came out unbelievably moist and soft… this will make it easy to reheat in a cast iron skillet without drying out too much. Perfect. The only substitutions I made were: almond butter for peanut butter and raspberry blush vinegar for white wine vinegar. Also, my sesame oil is toasted. This seitan will be fun to experiment with / change the ingredients.